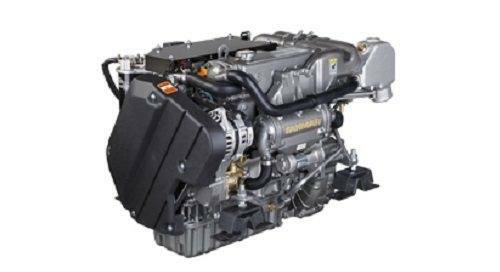 Same Compact Size and Control Hookup - The new line of JH common rail engines has the same foot print as previous models for easy replacement of new and existing applications. More Information and NMEA 2000® Protocol - The engine control unit (ECU) allows for access to more information, including engine operation and fuel consumption. New common rail design lowers emissions level. High quality two layer paint protects surfaces from rust. Belt safety guard provides complete protection from belts and moving components. 12V - 125A Alternator - The 12V – 125A Alternator allows for higher output and more power at a lower RPM. Common Rail Technology - New common rail technology allows for more precise fuel injection and smoother, quieter and cleaner operation.